Where in the world is RICKY DILLARD? 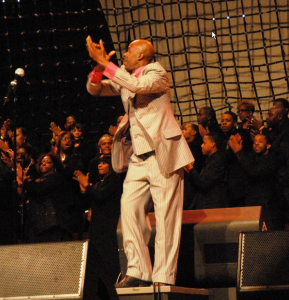 On the heels of the announcement of Ricky Dillard’s signing to Light Records, it has been confirmed that Dillard now shares in music ministry at the Ebenezer AME Church in Fort Washington, Maryland under Minister Byron Cage and the pastoral leadership of Drs. Grainger and Jo Ann Browning. Ricky continues to maintain a full schedule of dates touring with New G as well as conducting choir workshops and music seminars across the country. Dillard and New G was recently part of the “Brat Pack Reunion” that also featured Hezekiah Walker and Donald Lawrence at this year’s Gospel Music Workshop of America in Cincinnati, Ohio.